My sincere apologies….. this is not going to be a really good tutorial. They say a picture is worth a thousand words…. well I forgot to take some pictures and some are lost in cyber space. I’m doing this post because it’s at least a start. Anyone stopping by for help with issue quilts will get some ideas. Even if the instructions aren’t complete. I have another issue quilt waiting that I will try to do a better job of taking pictures for better instructions. 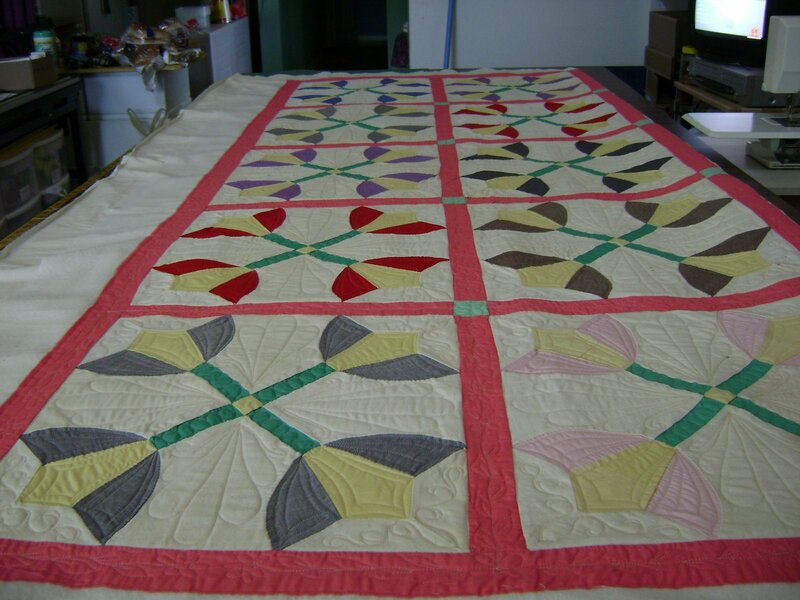 With issue quilts we cannot take it apart and remake it. (Unless we are hired to do that.) 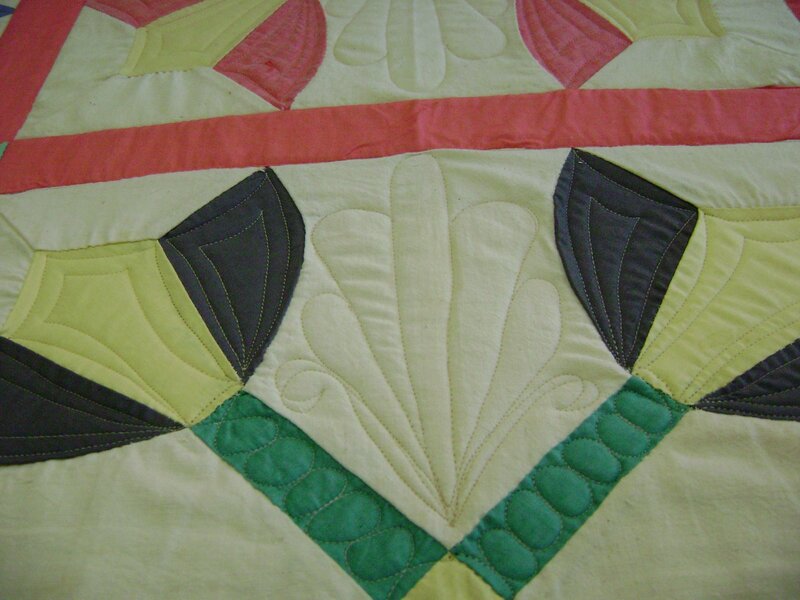 Our job is only to get it quilted so it can be used and loved. Ok, the first thing is that I always float the tops. Floating is when the backing is attached to the leaders but the top isn’t. The top floats on the backing and batting. Floating lets me control the top as I manipulate it to stabilize. I stabilize by doing a stitch in the ditch around all the blocks and borders. No quilting is done anywhere else at this time. I don’t stitch around any of the pieces either…. just around the blocks and borders only. 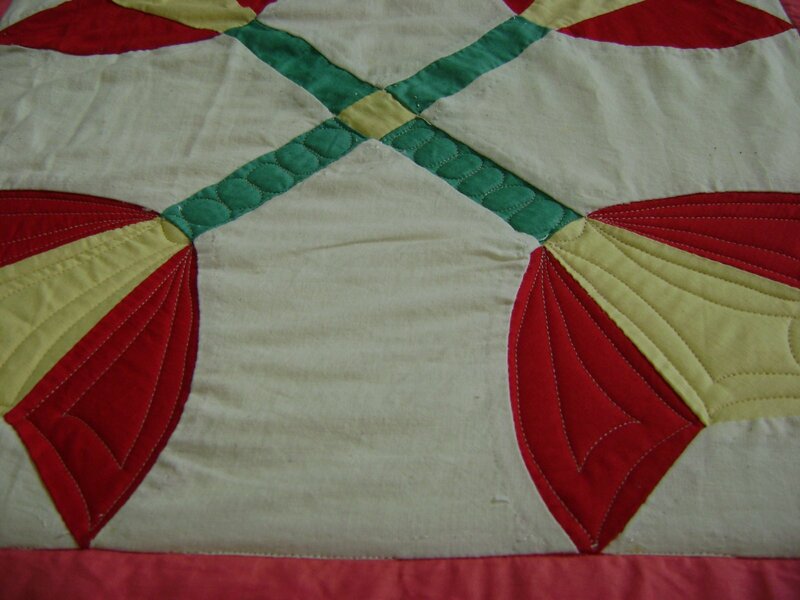 If I plan to do any stitch in the ditch around the pieces this is done at a later stage of the quilting process. As I stabilize I’m also going to the end of my machine to check on the straightness of the blocks (or sashing)…. by eye. I can look down the machine to see if the sashing is fairly straight. Since the top is floating; if I see things are not quite straight then I can lift up the top to shift it here and there. I don’t worry about extra fullness anywhere at this time. It’s more important to keep it “pleasing to the eye straight”. As I advance the quilt to do more stitch in the ditch; I’m keeping myself constantly aware of whether the top is doing the hourglass dance. This is when the beginning edge is very straight but the top gradually bows in toward the middle then outward again as you pass the center of the top giving it an hourglass figure. So here is when I can start showing pictures. I’ve done a stitch in the ditch to stabilize the whole top and basted along the edges of the top. Now that the stabilizing is done, I can move back and forth with the quilting….. going to the areas that need quilting first. Moving to the next area and so forth. Here is what the blocks look like after the stabilizing. See all the extra fullness in there? This is when I can start to deal with it. Before starting the quilting in each block; I first use my hand to evenly distribute the fullness as much as possible. Then I do a small amount of quilting in the block. Here I’ve done the stems and tulips on half of this block. That’s the only quilting I will do in all the blocks for now. I want the quilting to be done gradually in each block so it’s quilted evenly over the whole top. I hope that makes sense…. geeze…. I wish I could make a video! Maybe I can figure out how to quilt and film at the same time before I get to the next issue quilt. Here I’ve moved to another block and distributed the fullness as much as I can. Here I’ve done some of the quilting. I do only this much quilting in every block across the whole top. I don’t worry about the extra fullness in the other areas of the blocks… I only deal with one spot in each block at a time. When I reach the end of the quilt I start working my way back to the beginning by repeating the process of distributing fullness and quilting only one area of each block. Here is my third pass over the quilt top. 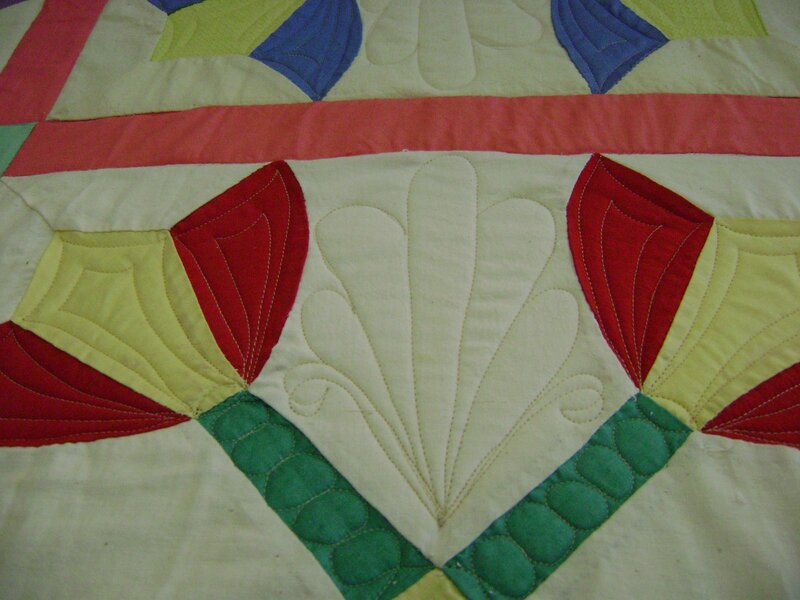 The tulips are all quilted and I’m quilting in the next area of fullness. I do the top of the block and the bottom of the block…. leaving the side areas for the next pass. I guess I should have also said that I do stitching designs with open areas where the extra fullness can lay without looking too obvious. As much as possible I do stitching that does not cross over itself. Backtracking is ok but crossing over creates tucks. 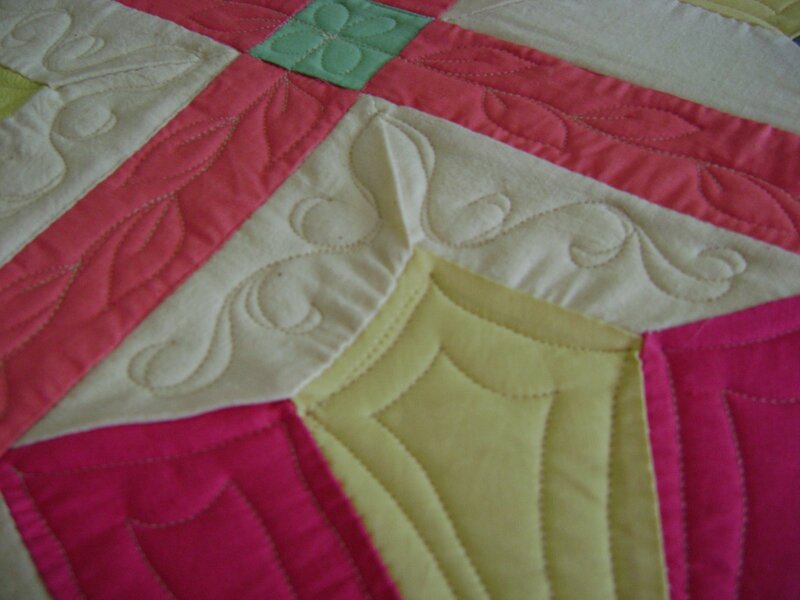 Tucks are very distracting to the eyes taking away from the beauty of the quilt. Tucks are much worse than extra fullness. and how it looks after. The next pass I did the sashing. No pictures…. sorry. Although you can see it in this picture. Yes, there is extra fullness in the sashing. But, it’s less obvious now. Next I started quilting the last area of the blocks… the corners. The fullness is still there…. I can’t wave a magic wand to take it all out. The point is that the extra fullness becomes far less of an issue when the quilting is done and the quilt is “eye pleasing straight”. Here’s what I mean. Here is the finished quilt. 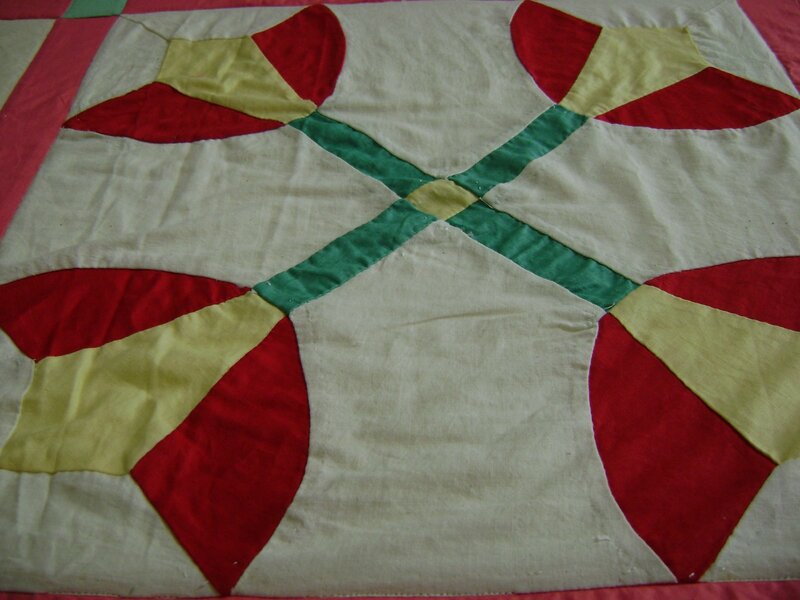 The sashing is relatively straight making the whole quilt look pleasing to the eyes. This quilt didn’t have any actual borders so I couldn’t show how I deal with those. A couple of washings and the extra fullness will relax into the batting. 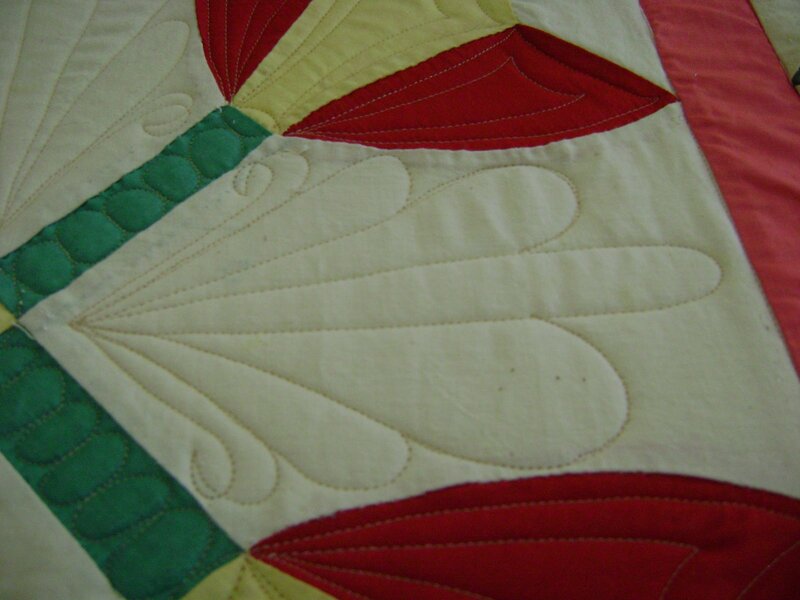 Vintage quilts are very rarely perfectly flat and even. 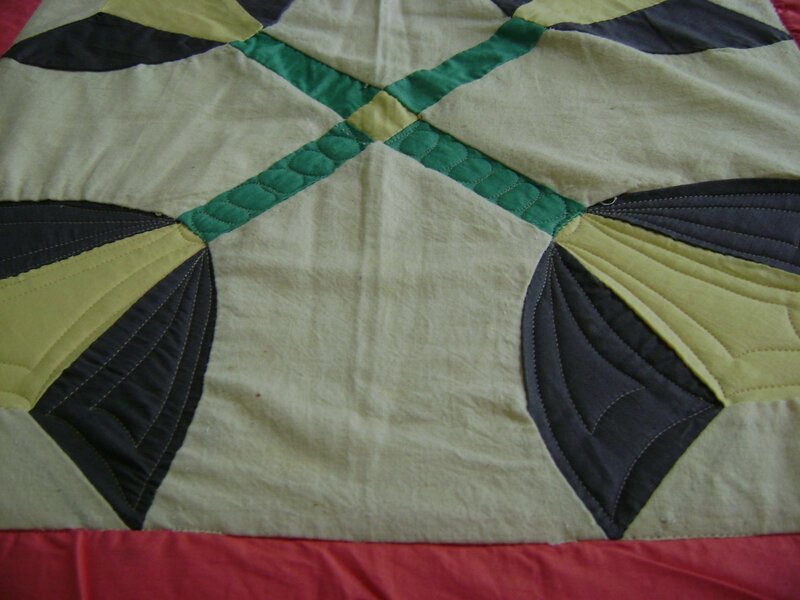 Vintage quilts were made by people without our modern tools and gadgets…. or our knowledge of pressing at each step of construction. In my personal opinion…. 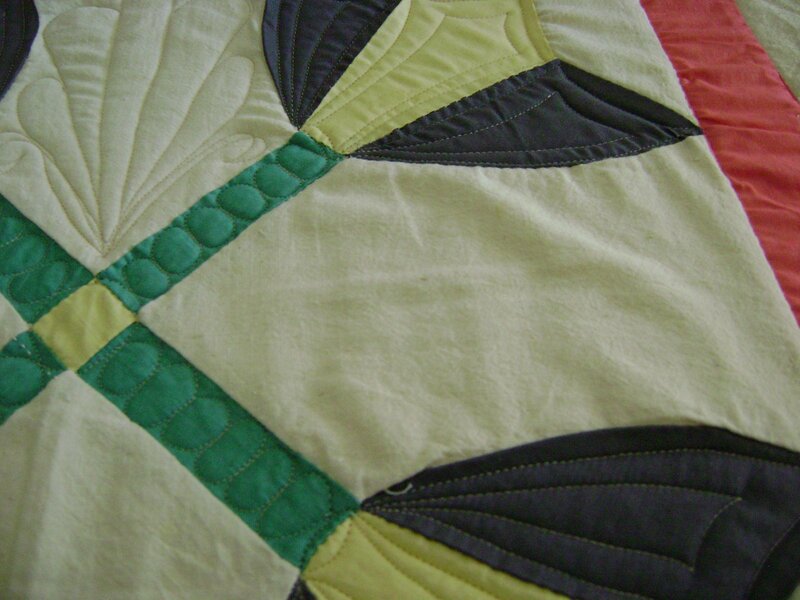 pressing… is the number one thing a new quilter can do to improve their piecing. It’s also one step a beginner will avoid doing. But that’s another tutorial story. Although this post isn’t quite what I had planned… I hope you get at least some useful information from it. 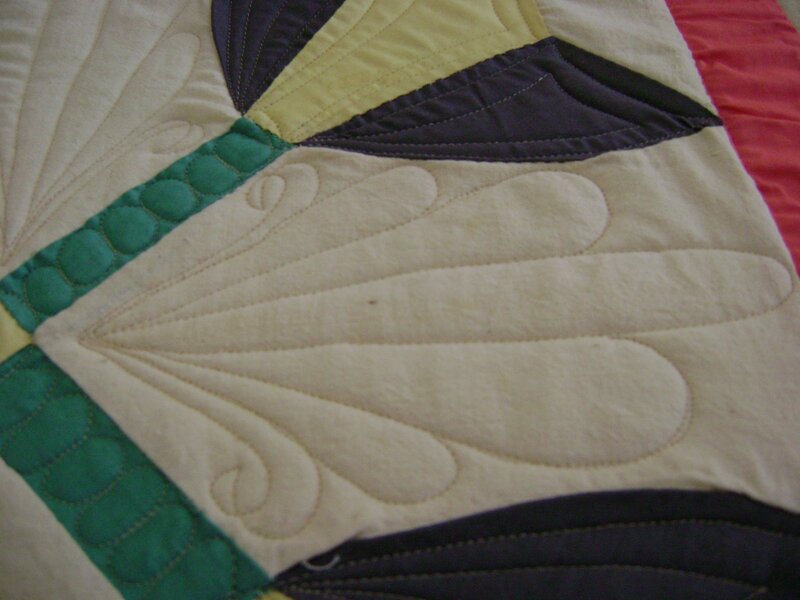 Issue quilts are a big part of the professional machine quilter’s income. Whether it be a vintage top, a beginner’s top, or a not so careful intermediate topper’s top….. issue quilts somehow find their way onto our waiting list. Only the most advanced toppers will create tops without any issues. 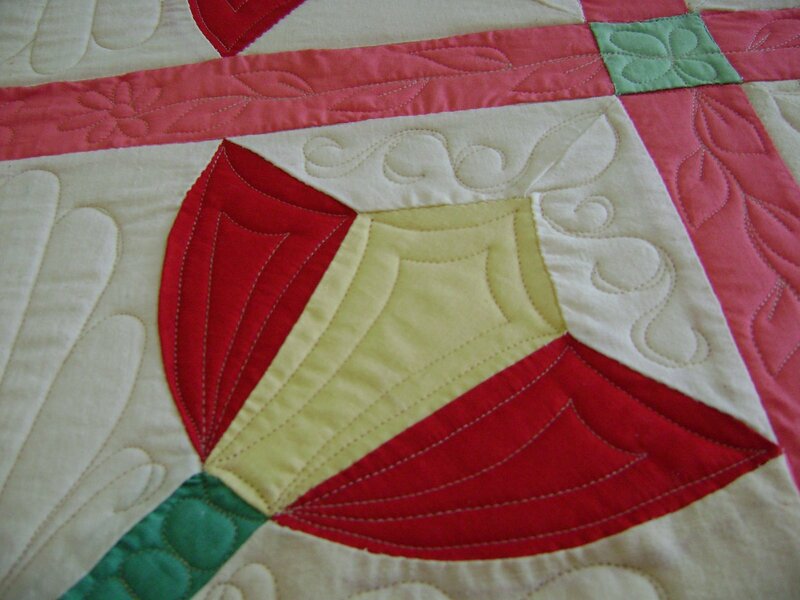 Learning to work with issue tops is a major part of becoming a good professional machine quilter. 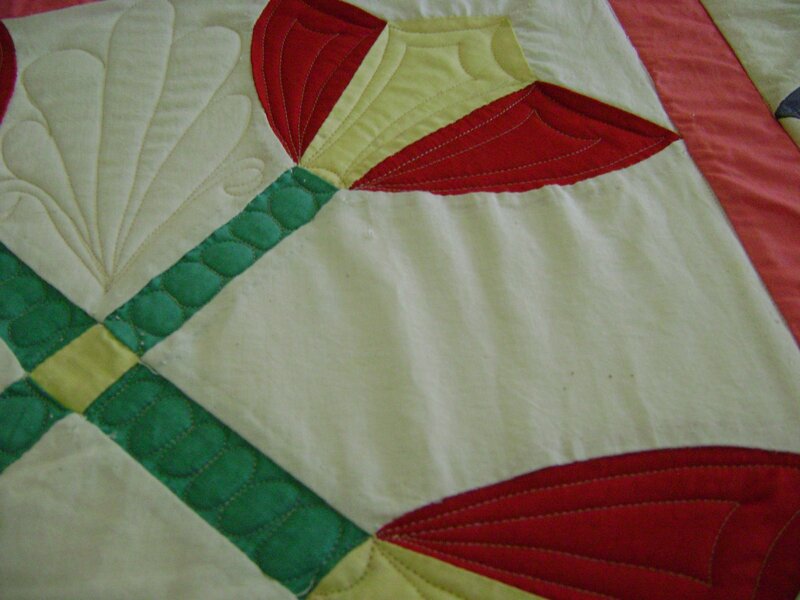 This entry was posted on May 25, 2009 by Anita in Quilting - business or hobby?.